Do Big Monsters Equal Big Fun? 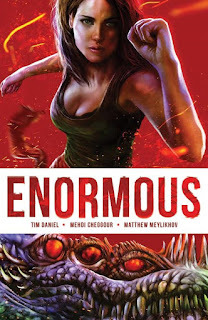 I'd heard a variety of positive things about "Enormous", now being published by 215 Ink. Apparently it has even be optioned for television. Well, I picked up the 1st trade awhile ago down at the ol' comic shop and recently had the chance to read a digital copy of brand-new issue #7 too; therefore, I thought I would offer my thoughts on the series and my enjoyment of it. The first trade of "Enormous" that collects issues #1-#6 is quite the good time, with only some complaints keeping me from thinking of it as the perfect big-monster comic. Written by Tim Daniel and illustrated by Mehdi Cheggour, there are a variety of characters that appear, but one big focus is Ellen Grace, a schoolteacher who quite early in the trade has to try and save her Mother who suffers from (what appears to be) Alzheimer's from a monster attack and attempt to return to the school where she and her girlfriend work. 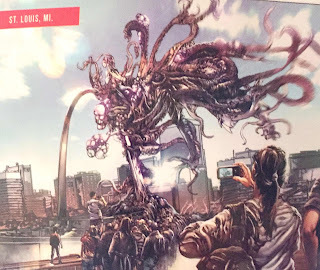 The reason for these enormous creatures appearing is hinted at towards the end of the trade, but the main thrust of the story is seeing how the sudden attacks around major cities by these gigantic beasts is causing immense societal trouble, or as the A.V. Club puts it, the comic is kind-of like "The Walking Dead" but with big ol' monsters instead of zombies. We primarily see how Ellen and other survivors attempt to deal with these monsters attacking and throughout the book you really grow to care about Ellen and feel for her when she loses loved ones. One slight against the writing however is that besides Ellen I didn't find myself really caring too much about what happened to other characters. It sometimes seemed like we would meet someone only for them to die a horrible death not too long after their introduction, which can be good as it shows no one is safe, but bad as it makes it difficult to form much of an emotional bond with anyone. I mean, if I figure somebody is going to die in a few pages why even bother remembering their name? 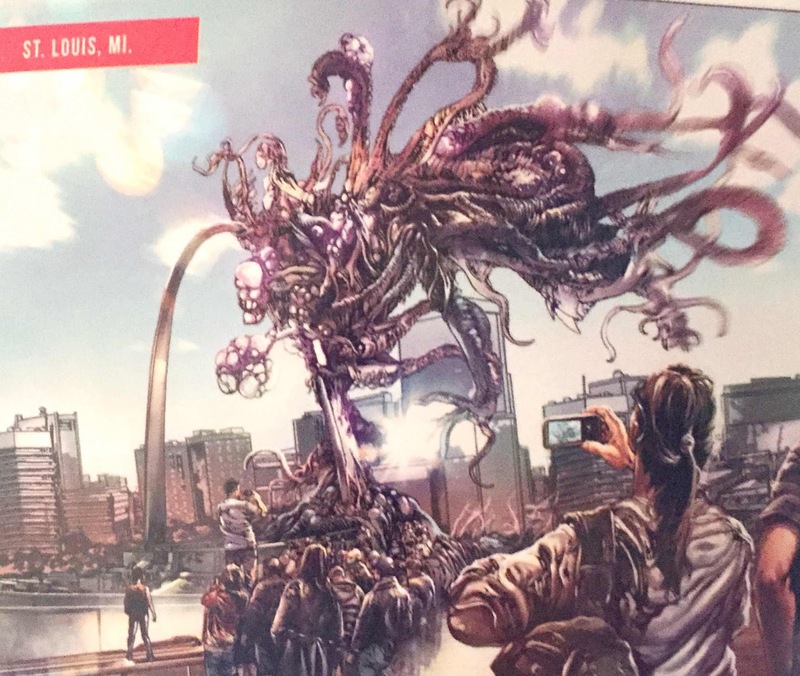 The artwork tends to be gorgeous, with the big monsters appearing genuinely disturbing and gross. The illustrations are lush and the colors have an expert balance of appearing a bit softer and less exotic where they should (buildings and the characters), and really popping when it comes to the more surreal stuff such as the huge animals. If had something negative to say about the artwork, it is that it sometimes can be really tricky to follow the action when a ton is going on within the page, and that can make it a bit confusing--"Oh, they went from the roof to inside the building somehow, maybe on this odd splash page?" Also it says Saint Louis is in Michigan instead of Missouri, a weird typo I noticed as I live around the STL area. "MI" instead of "MO" you say? Interesting. Also, Cheggour seems to really like using something along the lines of a "light bloom" feature in the comic, with lots of random streaks of light occurring at random moments, almost like they let J.J. Abrams loose into the comic and told him to go nuts with the lens flare (that may sound harsh on Abrams, but he really has over-used that trick in his flicks). Still, sometimes even if the artwork seems like it would work better as a really cool pin-up instead of a somewhat-obtuse assortment of panels, I really do like the art overall and my issues are more nit-picky than not. With the seventh issue a chunk of my complaints are actually addressed, with it being a relatively quiet event--taking place over just one big scene after a lengthy foreword that helps to get new readers up-to-speed-- and features a new character who seems to be a tough fighter. It is interesting how the issue is actually labeled both as the 1st of, "Season 2" and as the 7th overall, so I simply refer to it as #7 even though someone could argue its another first issue (which could help drive sales too). 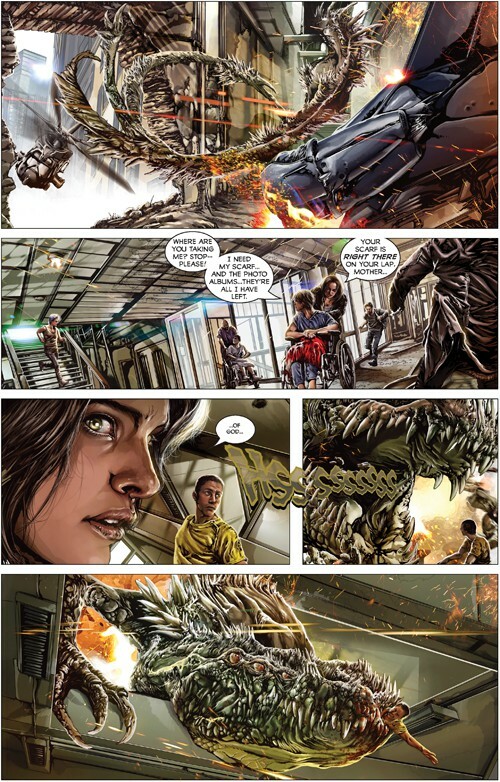 I'm greatly enjoying Enormous and would recommend you pick-up the first trade for only $9.99 or take advantage of a deal that seems to be going on at Comixology until July 28th where you can get all the issues for a 50% discount (I myself prefer having a physical copy of my comics generally, but to each his/her own). The seventh issue was an intriguing change of pace and easier to follow artwork-wise, so other than my continuing umbrage at how too many characters are underdeveloped and the artwork can be confusing I would say this is a stellar read.